I am grateful to New american jackets crew for turning my anniversary occasion so successful with this great Guardians of the Galaxy jacket as worn by Chris Pratt. I am so amazed how they came up with the idea to make this for women! A great job though. I would say there is not a slight difference in the designing. Every feature, especially the leather quality is outstanding. I am very much satisfied with your prompt shipment time. The size which I gave to them was my actual custom size, but these people are so attentive that they made it a little loose-fitting, so now it fits me impeccably. Great jackets at realistic prices! The front belted sleeve and open style attracts me greatly! I appreciate it!! Since my girlfriend loves these kind of movie clothing and wear this type of jackets from the movies and drama serials. So I thought, why not buy one for her birthday. 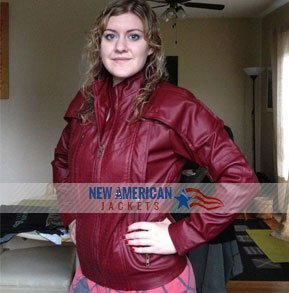 After some online research on my PC, I found the name of newamericanjackets.com with highest ranking. So I placed my order. I Cannot explain guys how great she looked when she wore at the birthday party here in LA. Every feature, especially the brown color and the front Ykk zippers are made of best quality. You cannot buy such a low-priced $139 jacket in such a remarkable quality anywhere else. She is enormously happy with this and said for upcoming shopping from this place. Thank You for your exceptional work! I absolutely love this jacket. It arrived much sooner than expected as well. The colour and quality is great with a sturdy zipper. I am very happy with this product especially at such a good price! It even comes in a fancy cloth bag and a pair of sunglasses in the package. The only reason I give 4 stars instead of 5 is because of the sizing. When they converted this jacket from the original men’s design into women’s, the proportions could have been better. If you have a large chest and small waist and hips, this will fit you perfect. I ordered a small (my waist size is 31.5 inches) and the bottom is very tight where it reaches my hips while the chest area is still too big (although that won’t stop me from wearing it, I still love it). Just a tip to buyers, it may be worth it to have it tailored to your measurements. Also watch for the waist size in the sizing chart, it’s tight at the bottom. We get the privilege to introduce the most exceptional piece of fashion exclusively for all the young girls. Presenting to you the all new edition of the Star Lord Guardians of the Galaxy Jacket in women’s version which was worn by the actor Chris Pratt in the 2014 blockbuster movie “Guardians of the Galaxy”. Crafted from the finest quality of synthetic leather, the Guardians of the Galaxy Women Jacket is must have choice for those young girls who wants to raise their unbeaten charm in party nights, Cosplays and in other semi casual events. It’s a perfect women’s outer that can be donned casually or even as daily wear attire.